When a long lost spell to restore the world is found, Ormhildur, a timid librarian goes on a journey to cast the spell, fighting forces of magical beings on the way. - ormhildurs Webseite! When a long lost spell to restore the world is found, Ormhildur, a timid librarian goes on a journey to cast the spell, fighting forces of magical beings on the way. 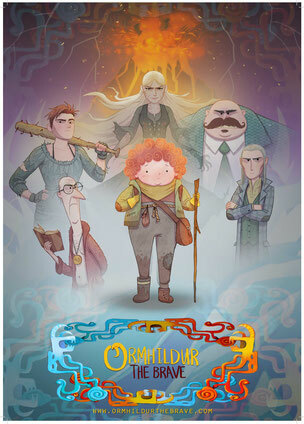 Ormhildur is a 2d animated comedy series intended for pre teens and the family market. The story has a sarcastic and sometimes grotesque sense of humour. Yet the story has a noble aim, its intent is to make the audience question human dominion over nature. The story parallels our modern day concerns of global warming and the environment but presents these concerns in such a surreal and ridiculous way that the audience is able to laugh.